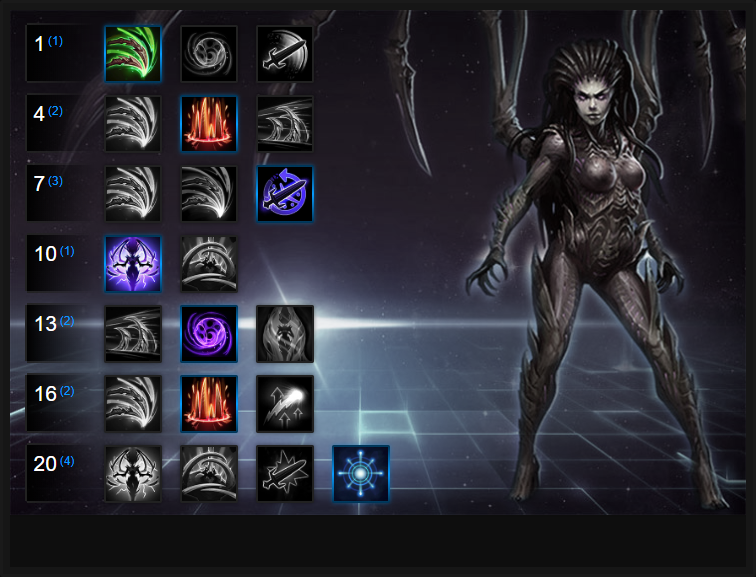 In this Kerrigan Build Guide, we provide an overview of her strengths and talents. Kerrigan is a powerful melee assassin that is capable of dealing high single target damage, but also controlling the battlefield thanks to her pull and stun. In a team fight she can prevent any opposing player escaping and with her trait, she can shield herself by dealing damage. The one major downside to Kerrigan is that outside of Queen's Reach, she has no real means of escape until late game. That said, she brings a great deal of utility to her team thanks to her pull/stun combination, and this alone can cause great difficulty for any team. Unsurprisingly and like most melee Heroes, she relies on good positioning and a solid engage. Assimilation (Trait) - Assimilation allows Kerrigan to gain 100% of her damage deal from basic attacks as shielding. The key to it being strong is the fact the amount returned is doubled against Heroes. Although it won't keep you permanently alive if someone is beating on you, it does provide you with some valuable mitigation and allows you to go toe to toe against most Heroes. Ravage (Q) - Her only source of mobility, Ravage is a leap that deals high damage on impact and the ability resets if you kill your target. When talented, it can be used on allies to allow you to easily escape (similar to Kharazim's Dash). I must stress that to simply Ravage into a fight, with little thought for positioning or whether you can make it out after the dive will almost always see you killed (or seriously harmed). Ravage is a ability that's based on committing to a fight - if you're leaping in, you need to be killing the target or ensuring that your team is following up behind you. Impaling Blades (W) - Kerrigan's W places a trap on the floor that springs blades after a brief pause. It stuns those hit for 1 second, regardless of how many people are on it. It's best used just before Primal Grasp so you pull players onto it. The ability rotation however (Ravage > Impaling Blades > Primal Grasp) does take practice but is fundamental to her play. Primal Grasp (E) - Undoubtedly her strongest ability, Primal Grasp allows Kerrigan to pull any enemies and Heroes caught in its grip. It's range is good, and you can grab a whole team if they're grouped together. Paired with Impaling Blades, it's an awesome spike that causes high damage while drawing enemy players significantly out of position. There is a slight delay as you cast Primal Grasp so be sure to take this into account when attempting to land it. If you can, you should always attempt to pull a high value target. At the very least and if you land your full attack chain, they'll take huge damage. Maelstrom (R) - Arguably the better of her two Heoric abilities, Maelstrom deals damage per second and you can still use your abilities during it. It's effectively a glorified damage over time ability that lasts for 7 seconds. Its damage output isn't huge, but if you're in amongst the enemy it provides a reasonable amount of additional pressure. Just don't use it too early - preferrably before your first Ravage. Ultralisk (R) - Great against beginner teams or when soloing, Ultralisk allows you and your creature to deal huge damage against a single target. Unfortunately, it's also really squishy and most compotent teams will blow it up instantly. While it does have value in 1 on 1 situations, due to the abundance of AOE skills in Heroes of the Storm they never last long. At its best, it's reasonably good for zoning an enemy Support so they have to retreat or pay attention to killing it. Siphoning Impact allows Kerrigan to instantly gain shielding from her trait when she uses Ravage. Considering Ravage now has two charges, it allows Kerrigan to instantly ping-pong for a total of 180 shielding. Allowing Kerrigan to stack damage on her Impaling Blades up to a bonus of 150%, Kinetic Fulmination is very strong in a team setting. Lasting 10 seconds, if Kerrigan damages an enemy she gains the bonus, ensuring that at cap, if she dives and grabs the entire enemy team, they'll take massive damage. Kerrigan relies massively on her abilities so having their cooldowns reduced by 0.6 every basic attack you make is significant. Considering the amount of time you should be dealing basic attack damage, Blade Momentum shaves considerable time off your cooldowns. The best of two poor Ultimate abilities, Maelstrom allows you to deal persistent damage around yourself. It's not mind-blowingly good, but it's a fair bit of damage and gives you reasonable shielding return. Combined with your splash damage from Fury of the Swarm, Kerrigan can offer valuable AOE pressure. Although Volatile Power reduces the duration of your trait's shielding by 3 seconds (from 6), it does increase the bonuses by 15%. While that might not sound a great deal, but when you chain your abilities together and land them on multiple foes, it provides Kerrigan with a lot of protection. Building on Kinetic Fulmination at level 4, Painful Spikes allows Kerrigan to deal bonus damage to all those hit by your Impaling Blades, for the next 6 attacks. The damage isn't enormous, but it's enough to ensure she deals a solid amount of additional damage. A guarenteed means of escape for Kerrigan, Psionic Shift allows you to move out of harms way when you need to. What's also great about Psionic Shift is that if you use it offensively, it deals reasonable damage and returns 300% of that damage as shielding. Never a bad thing. These Hero Threat Levels (1 being lowest threat and 10 being highest threat) are to help you determine which enemy Heroes can give you a headache. Any Heroes that aren't on this list are easy pickings for Kerrigan. If a Hero is listed here, take greater care. Murky: If he keeps dodging your combo (which he easily can) he will slowly kill you with slime, a Puffer Fish and Octograb. Thrall: His Feral Spirit combined with self healing means he'll often beat you 1 on 1, even with your shielding. His Windfury and Chain Lightning offers too greater damage. The Butcher: Lamb to the Slaughter, his Butcher's Brand and Onslaught mean that The Butcher, 1 on 1, is a huge counter to Kerrigan. You can't escape him and you can't kill him. Brightwing: Although she won't technically kill you, Brightwing is a hard counter to Kerrigan with her Polymorph. The moment you dive into combat, she'll Polymorph you and then you're in serious trouble. Jaina: Her slows, Water Elemental (should she take it) and her range make her incredibly annoying to fight against. A skilled Jaina can dodge your combo or keep you far enough away that you'll never reach her. This list of tips and tricks are just a handful of things we think will help your Kerrigan play. We'll continue to add to the list as required and if you have any tips you'd like to share, let us know in the comments below and we'll place them here. 1. Your most important attacking rotation is Ravage > Impaling Blades > Primal Grasp. It deals huge damage to just about anyone or at the very least, allows your team to. 2. Even though you gain shielding from your trait, the gain isn't huge so you should still be cautious when 1v1ing someone. 3. Try to use Maelstrom when you're near enemies as you don't move quickly and the radius isn't huge. 4. Primal Grasp is mana efficient for clearing minion waves now that you gain mana return on enemies hit - combined with the DOT, it's easy to solo lane. 5. Try to position yourself in a fight so you can leap in with Ravage on the squishiest target, and follow up quickly with Impaling Blades > Primal Grasp. 6. Remember that later game you can use Ravage to leap to allies if you talent for it. It will save your life. 7. If Jaina is on your team and she has Water Elemental, Summon Ultralisk can also work as two AI opponents on the battleground bolsters your teams damage output. 8. Never dive into a fight first. You'll just die and be unable to get away. Wait for your Warrior. 9. Primal Grasp and Impaling Blades is a lengthy period of crowd control. The pull and stun prevents enemy action for at least 2 seconds - more than enough to deal massive damage.